A few months ago I lost the only Bible I owned. The pastor of my church presented it to me after I was saved and baptized way back in 1979. At first I was upset that I had lost the Bible I had been studying for 35 years. But then I thought, as long as someone else is reading it and it brings one or more people to Jesus, then I’m good with that. Anyway, my landlord bought a whole bunch of furniture from a hotel that had gone out of business. He gave some of it to me, including a bed stand. After praying that God would send another Bible to me, I just happened to open the drawer of my new bed stand to put some things inside. 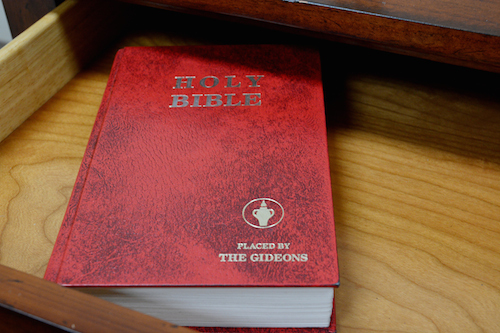 And there was a Gideon-placed NKJV Bible. Exactly the translation version I wanted. Thank you for your wonderful and necessary work.